Based in Media Arts study, a group from the University of Plymouth put a keyboard and computer in a monkey enclosure. They also set up a webcam so that everyone could see what the monkeys were doing with the keyboard. 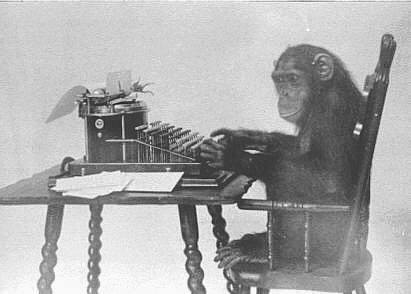 They thus exploited the popular value of the infinite monkey theorem. [The project] aims to raise questions in the minds of viewers, as well as those visiting the vivaria website, as to the role of chance in evolution and the creative process. Raising questions is easy. Contributing to finding answers is more difficult, and more useful. For instance, the usual argument against the theory of evolution is that complex forms and behaviours could not evolve by random chance alone, and that change is cumulative. The current best understanding of biological evolution doesn’t imply that biological evolution depends on random chance alone. Evolution arises from reproductive competition in a particular environment. The environment is key to evolution. The environment isn’t random. At least some organism can change their rate of genetic mutation in response to different environments. Genetic mutation doesn’t depend on chance alone. An orthodox Darwinian view of evolution is that through competition between organisms, only the fittest survive and produce offspring. This not only oversimplifies the issue but also makes an unacceptable political metaphor – where the rich get richer and the poor get poorer. Putting a keyboard in a monkey enclosure shows praiseworthy political sense for concern about the poor. The project organizers are likely to survive and prosper. The project is clearly not a scientific experiment, but hopefully does display some sense of integrity. Although it appears to test the truth of the formula, in reality it emphasises [sic] the unreliability of human (scientific) hypotheses. Animals are not simply metaphors for human endeavour. The joke (if indeed there is one) must not be seen to be at the expense of the monkeys but on the popular interest in the idea – especially those in the computer science and mathematics community (interested in chance, randomness, autonomous systems and artificial life). Humans are much more verbally sophisticated than are other animals. The contrasting predicate, “but hopefully does display some sense of integrity”, acknowledges a sensible, contrasting evaluation. “The joke (if indeed there is one)” points to insecurity. Laughing at monkeys isn’t immoral. Laughing is a natural, healthy response to certain types of behavior. The creative thinking subject as the site of consciousness, and the subject as a crucial part of a sentence and text – that which the action is determined by – remains a contested and contradictory set of ideas. Creativity is neither random nor entirely predetermined, in other words. The project aims to address these ideas, to activate these contradictions, and demonstrate how these contradictions generate new ideas and possibilities, and in turn provide a much more acceptable political metaphor. I get it. Putting a keyboard in a monkey enclosure provides a much more acceptable political metaphor. Remember that for the final exam. I like those monkeys’ spirit. Project participants offered for sale the monkeys’ text, in a limited edition of 100, for £25 each.